Just like Texas Hold’em, the main aim of Live Casino Hold’em is to create the best possible five card poker hand using a combination of two hole cards and five community cards. 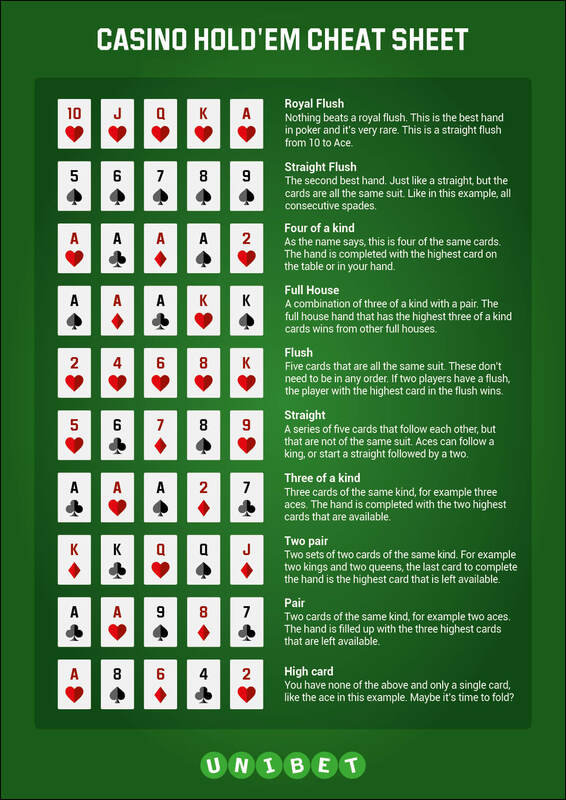 It is played with a standard deck of 52 cards and the rules are easy enough to learn but you need to be familiar with the standard five card poker hand rankings. IMAGE re: Five card poker hand rankings. How do you play Live Casino Hold’em? You kick off the game by placing chips on the ‘ante’ section of the table. This is similar to a blind in online poker and it needs to be paid prior to the cards being dealt. Once you have paid your ante, you and the dealer will be dealt two cards each. You can see both of your cards but not the dealer’s. A further three community cards will then be dealt to the table. If you have made an optional side bet, the result of that will be determined at this point. You will win if you can make a pair of aces or better using two cards and the three community cards. Once the side bet has been settled you have to make your decision. You can either fold your hand and lose your ante or keep on playing. To keep on playing you need to make a call bet which is double the stake of your original ante. If you do decide to make the call bet, you will receive a further two community cards at the table. It is at this point that you have to create the best five card poker hand available. Luckily for you, our system will automatically determine this for you. Your hand will then be compared to the dealer’s. If the dealer has a better hand, you will lose your ante as well as your call bet. To play this superb table game optimally, you need to make the right decision about whether to play after the first set of cards have been dealt or whether to fold. Although this sounds simple enough, there are a number of factors that you need to take into consideration. At this point you need to consider the strength of your hands as well as how your hand would improve once the remaining two cards have been dealt. Since you are also competing against the dealer, you need to keep in mind how strong their hand might be and how it also might improve. Call with a flush or straight draw provided that you only require one card to complete a flush or a straight.